Even though Monday is cross-training day, I just couldn’t stand it. It was BE-U-tiful! outside today. The high was 69 degrees! Oh yeah. 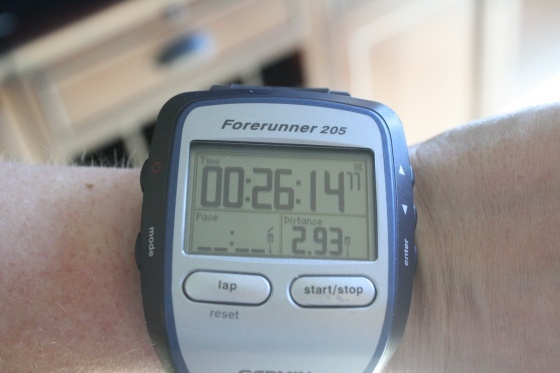 I did a very quick almost three miles in just over 26 minutes. That’s supa’ fast for me. I was getting it. Most of my route was through a huge cemetery in uptown just a few blocks from our condo. I love cemeteries. I whipped up a huge salad right after my run for lunch. In reality This salad was originally twice this big. I got a little out of control. Before I finished adding all of the toppings, I put half of it in a plastic container for another day. 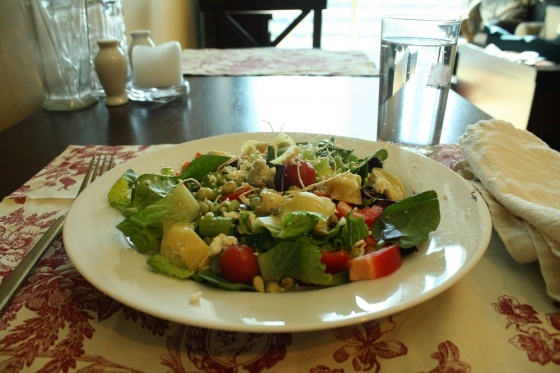 On my plate: romaine, spinach, purple cabbage, cherry tomatoes, carrots, artichokes, red bell pepper, sprouted peas, pepitas, feta cheese, and celery. 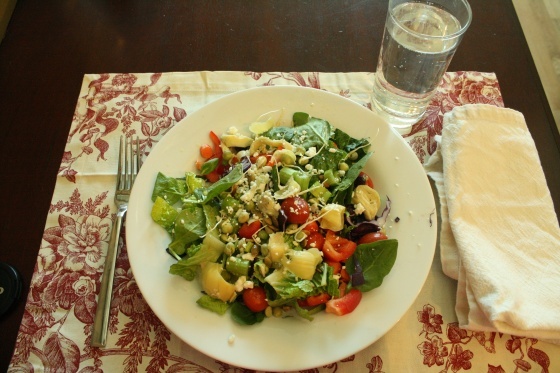 I drizzled honey, a bit of extra virgin olive oil, and lemon juice on it as dressing. Delicious. 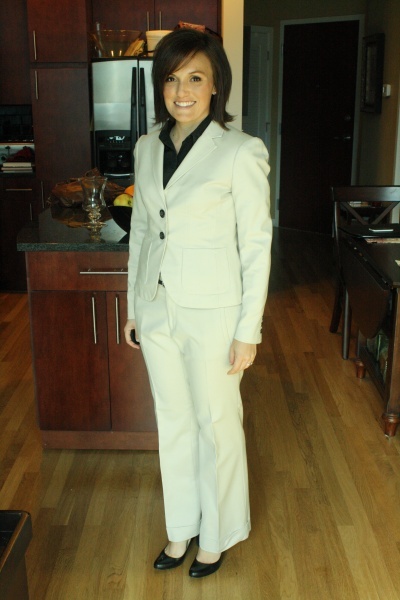 After lunch, i showered, threw on a suit, and headed off to my job interview. I’ll know more about how it went tomorrow. I was hungry for a snack when I returned home. 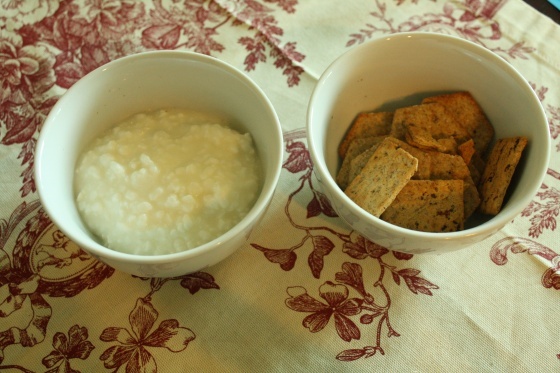 Low sodium 2% cottage cheese to the left, the last of the Wheat Thins and Kashi crackers to the right. I also inhaled three kiwis before heading to a new yoga class around 5:30 pm. A new studio called Arrichion just opened very close to our condo and our new house. There was a Living Social deal for it last week, $20 for 20 classes. You have to use the classes up in two months, which will never happen since I spend so many days running during the week. But, even if I only went four times, I would have spent an equal amount at my usual yoga studio. I liked the hot yoga class a lot and man, it was hooooot. It was called Bloodstone and here is the class description. Bloodstone or heliotrope means turning to the sun in Greek. Ancient Greek gladiators wore bloodstone talismans for protection in battle. Equally important in Indian culture, the bloodstone is used for healing. The Arrichion Hot Yoga Bloodstone series is a challenging flow yoga workout practiced to music. Central to the Bloodstone series is the sun salutation asana. Bloodstone is a great strengthening and endurance workout. It is especially effective for competitive athletes. I’ve gotten used to moving in and out of poses in a particular way after practicing at only one yoga studio for several months. I caught myself falling into the the transitions that have been ingrained in me and had to focus on what the instructor was saying. One of the biggest difference in this studio and my other studio, Y2Yoga, is that Y2 has mirrors and the instructors do not call out instructions the entire time. You get into a pattern and you repeat it over and over again. The repetition was there at Arrichion, but there were no mirrors. I was glad the instructor continuously called at the moves because I had nothing to refer to if I lost my way since I was in the very front of the class. Overall I really like both studios and I think I’ll be happy practicing at Arrichion for the next two months. Now, I’m off to make Valentine’s dinner with my Valentine! The third week of Tropical Traditions coconut giveaways is on! This weeks giveaway is actual coconut. But not just coconut a 2 lb. tub of it. Tropical Traditions 100% natural S Coconut Flakes are made from organic dried coconuts in the Philippines that are grown with no fertilizers or pesticides. This premium dried coconut contains no additives or preservatives, and is not sweetened. Unlike most dried coconut on the market, our dried coconut products are not treated with sulfites to keep them white. They are a great addition to recipes and baking, or just for snacks! 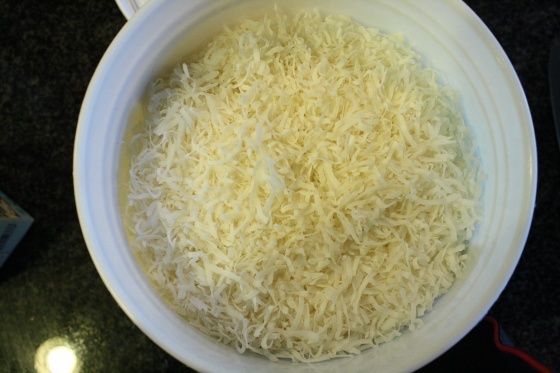 Note: The Coconut Flakes are a larger shredded coconut cut, perfect for garnishing or toppings, such as the top of a coconut cream pie. That’s more than enough to feed a small army macaroons for quite some time. 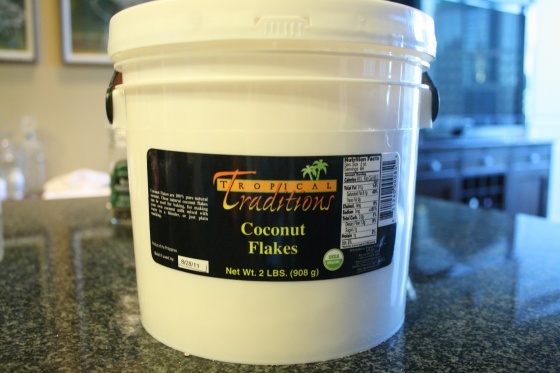 2nd entry – Tweet “@Foodiefresh is giving away @TropTraditions coconut flakes! #giveaway http://foodiefresh.com” and tell me you tweeted in the comments. Thanks for entering and especially thank you for reading! I really do love my readers. I would put it in my oatmeal and smoothies! Thanks for having this giveaway! Lots and lots of macaroons – and perhaps some coconut-rich granola! I hope your interview went well Kelly! You should try Arrichion, b/c it gets super hot. I almost want to say hotter than Y2, but everything feels hotter when you’re in the middle of it, right? The also have classes that are half yoga, half circuit training. We did push ups near the end of our class last night and they did not lower the heat like they do at Y2 when we move into ab work. It was intense. I would make coconut butter and coconut macaroons with that! Omg, that is a tub of amazingness!!! Awesome giveaway! I’ve never made macaroons but really want to try making them, so that’d be a definite. I think I’d also like to try putting coconut in pancakes sometime. Yum! I would probably make the fiancée a ton of coconut shrimp and experiment in finding a comparable vegetarian option! Coconut-toasted tofu?? Oh my gosh, I would put it on everything! Cereal, oatmeal, muffins, icec-ream, yogurt, cottage cheese, fresh fruit, salads, pumpkin soup, green beans…heck, even chicken!!! The possibilities are endless! I think the question would become what WOULDN’T I use it for? I love making raw chocolate coconut balls and freezing them! What wouldn’t I make with all that coconut!! I would definitely make some coconut butter [because I am currently out!!] and toast some for toppings. Of course macaroons would have to happen at some point too. Anyway! Your suit is super cute! where did you find it!? Oh, and I’m glad you’re liking the hot yoga classes….I have yet to “start” my 20 classes. Is it crowded at all? Thanks! I got it at Banana Republic. It is pretty crowded so I would get there a little early to snag a spot on the floor, preferably not right in front of the heater. Let me know when you’re going! I would make coconut cupcakes, put it on oatmeal, make some macaroons, possibly a cake… who knows what else!